British boxer Amir Khan will travel to Pakistan before the end of the year to show support for the victims of the army school massacre in Peshawar. Pakistani Taliban militants killed 141 people in the attack on 16 December. 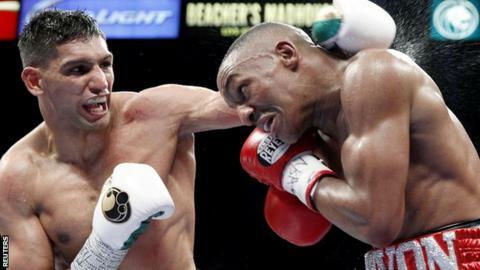 The WBC Silver welterweight champion's parents were born in Pakistan and he donated boxing shorts worth £30k to help pay for the school to be rebuilt. "I just want to speak the truth and tell people what is happening is wrong," Khan, 28, said. "I think it's more important now than ever to go over there. I think it will send a statement to a lot of people that Amir Khan is going there to make a difference. I want it to be a better country," he added. Khan, who in May became a father for the first time, plans to make the trip between Christmas and the new year. "The news hurt me even more having a little girl," he said. "Imagine sending my daughter to school and hearing that she got killed. Innocent kids, killed over nothing. These people are ruthless. "It's very disgusting seeing or hearing stuff like this. You can never think people will be that sick in their mind."